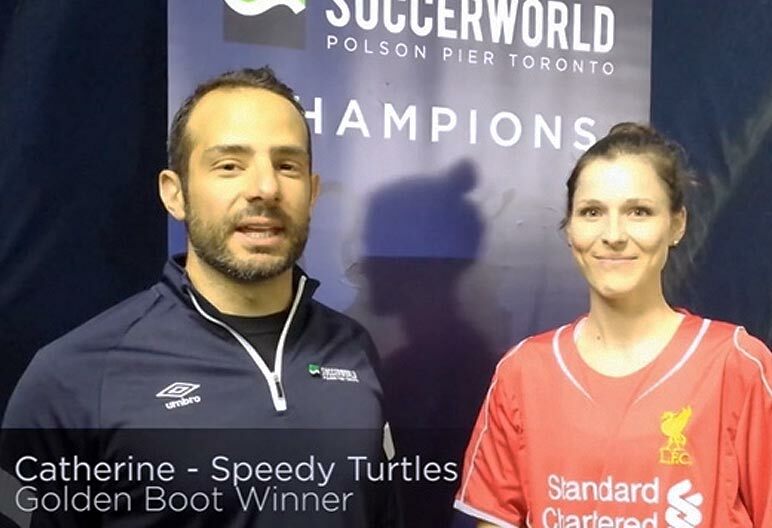 Catherine Nutt from the Speedy Turtles is first recipient of the female golden boot in a Co-ed Division. To mark this memorable occasion, we decided to interview her and see what she thought about being the first to win this golden boot. Catherine is a fierce competitor who can play multiple positions in indoor soccer. With a strong shot and precise finishing, she scored 7 goals this past season in the Tue/Wed Co-ed Division 2 East. We should give some credit as well to her teammate George Love, who also collected a golden boot as the outright top scorer of the division. The pair worked well together setting each other up for many of their goals. They scored a combined total of 17 of the team’s 22 goals for the season. It’s safe to say that the scoring duo were an integral part of the team’s success. Congrats to the both of you! Ryan Franke and the rest your team are lucky to have you playing with them!